Today I have an incredible, easy recipe. In fact, this post is more an assembly than recipe. Simply look at the photos. Fresh ciabatta bread baked with the ultimate topping. 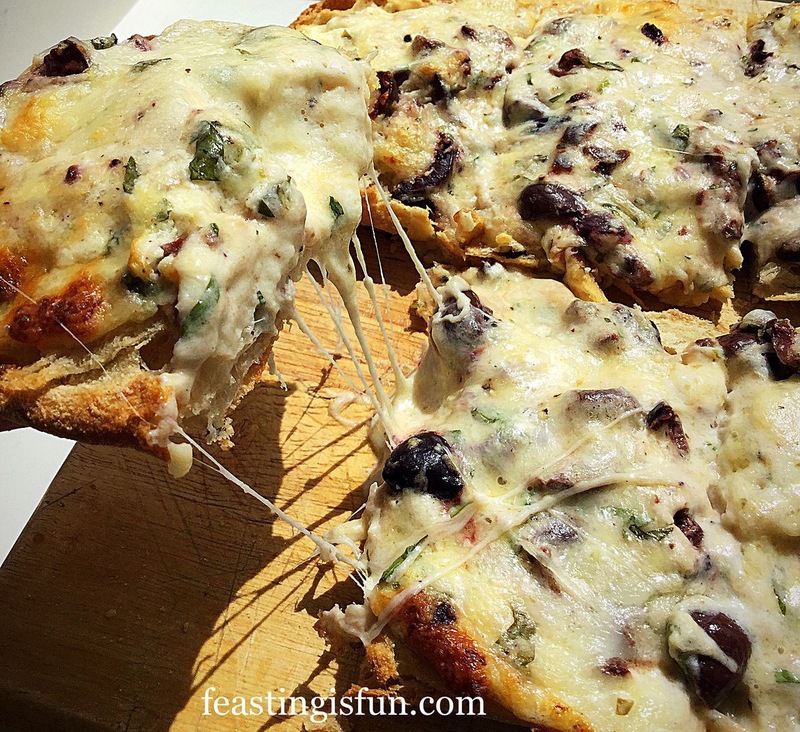 I chose three different cheeses, kalamata olives and fresh basil. 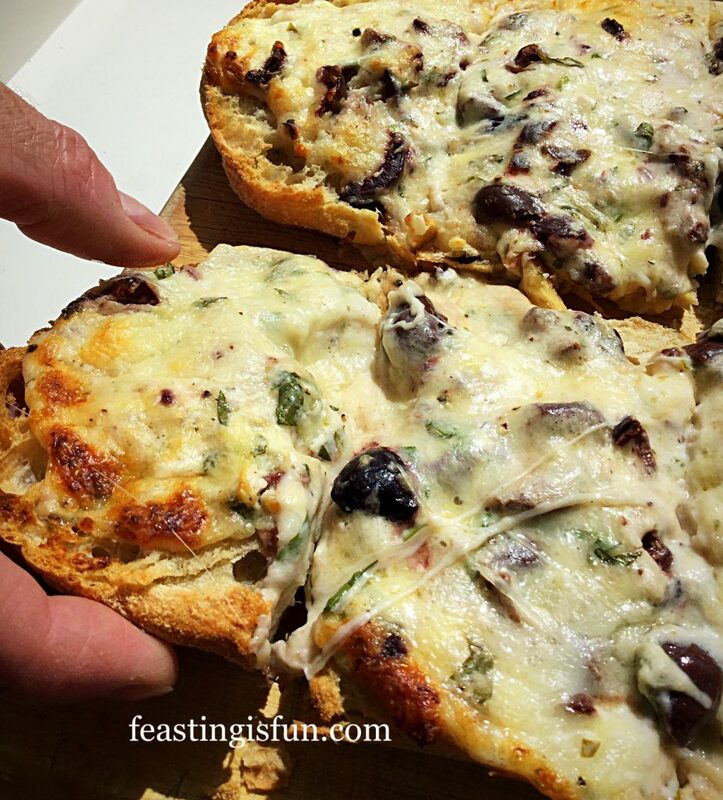 Resulting in crisp, crusty bread with the most flavourful, salty, fresh herb spiked, cheesy covering, Baked Cheese Olive Ciabatta Bread. 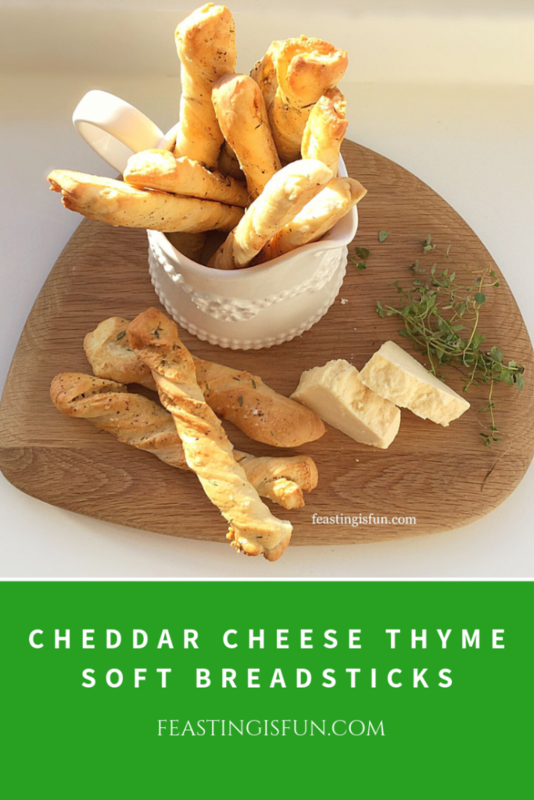 I used a combination of Philadelphia cream cheese, mozzarella and sharp cheddar. 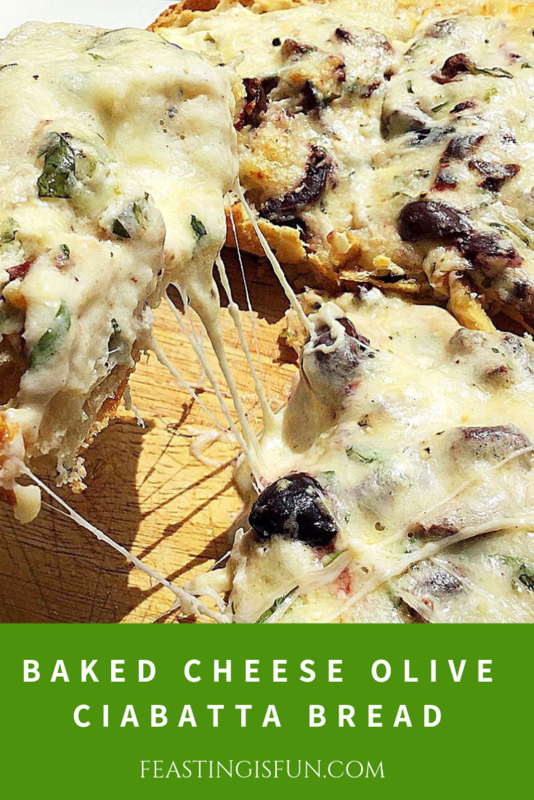 The result when baked, is melting gooeyness and great cheese flavour. Also, adding meaty kalamata olives and fresh basil, results in an overall herby saltiness that goes well with cocktails, especially a Martini. 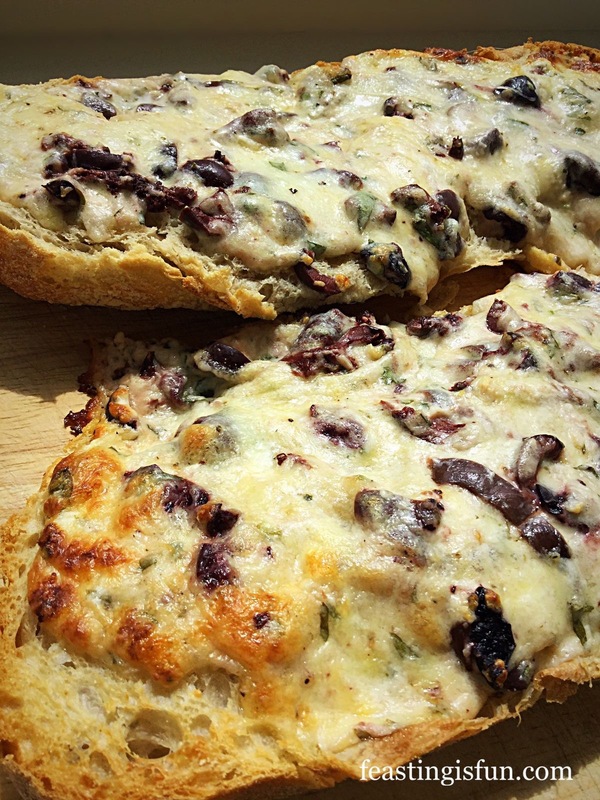 Because the topping is overly generous, it could be split to cover two open Ciabattas. 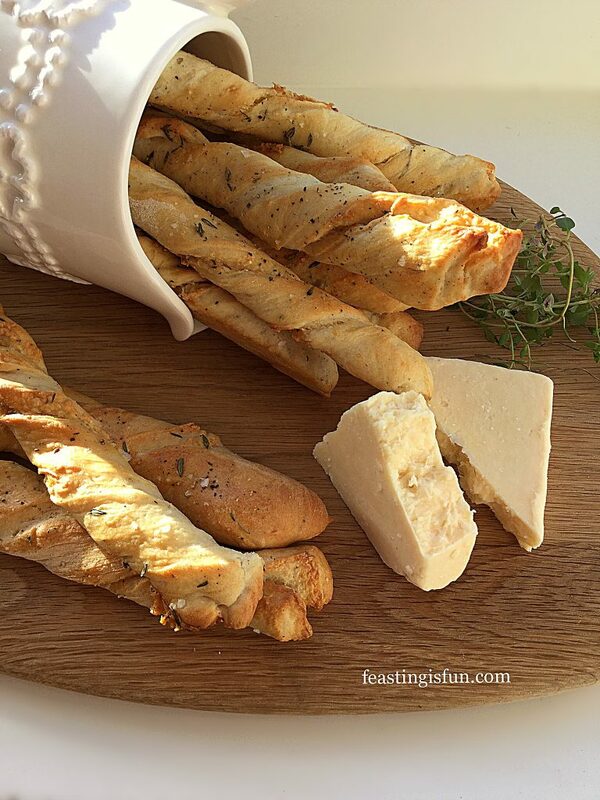 Also you could slice the ciabatta thinly, or cut into squares and these would make elegant, pre dinner canapés. 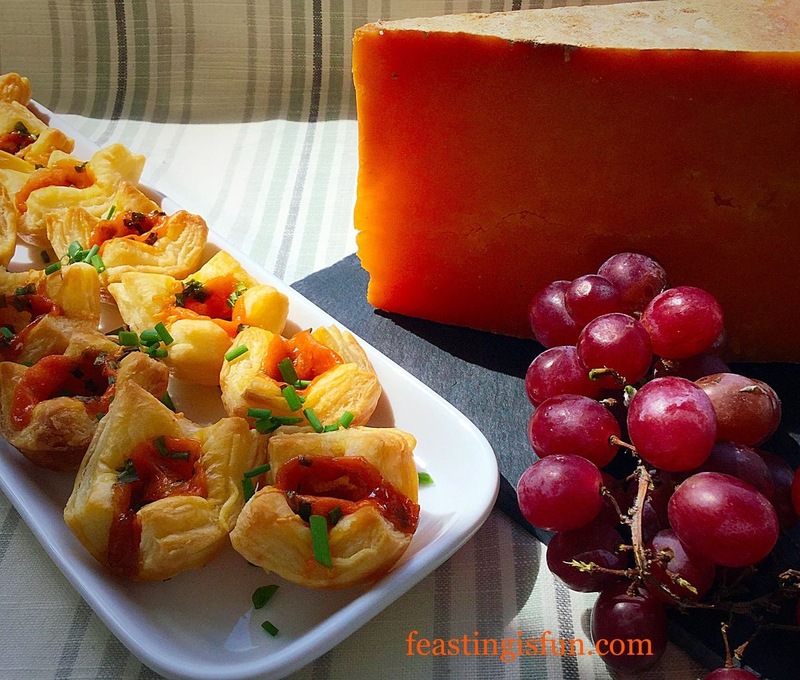 I love cheese and think it tastes even better when melted? First of all place a medium sized bowl on to some digital scales. This will make adding ingredients much easier. 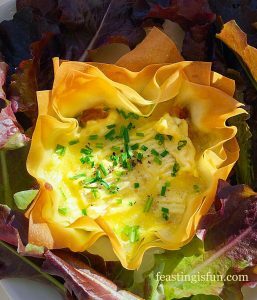 Spoon the Philadelphia cream cheese into the bowl and break up the drained mozzarella cheese, adding it to the cream cheese. Next add the grated mature cheddar to the bowl. Remove the stones from the olives. Press each olive with the flat side of the knife. Remove the stone with your fingers. Chop the olives roughly, adding to the bowl until the correct weight is achieved. Now chop the fresh basil fairly roughly and add to the bowl. Add 1/4 teaspoon of freshly ground black pepper. 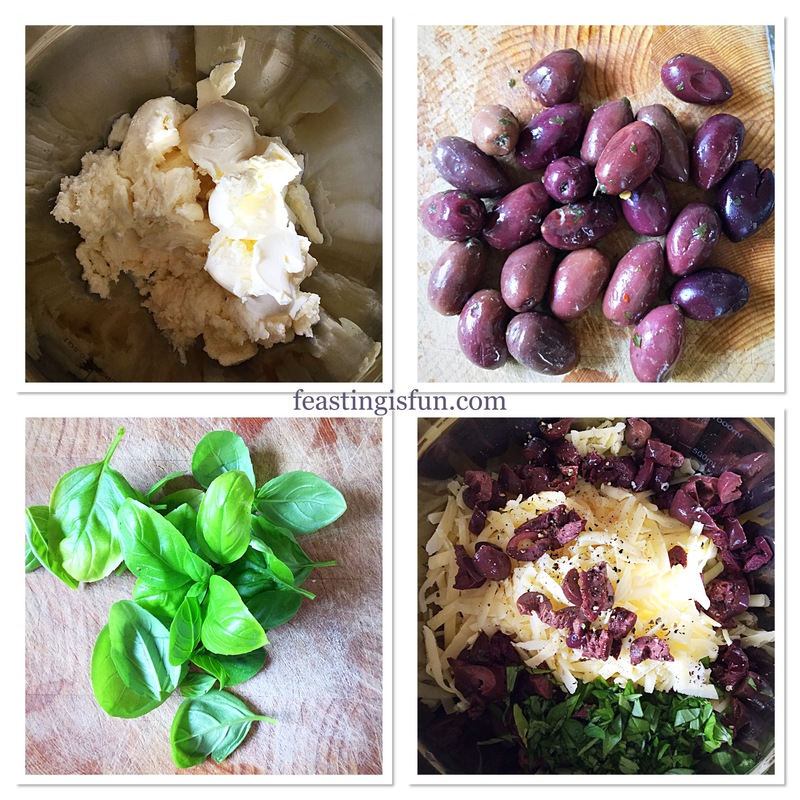 Preparing the cheese, olive and fresh basil topping. Use a fork to mix all of the ingredients together. 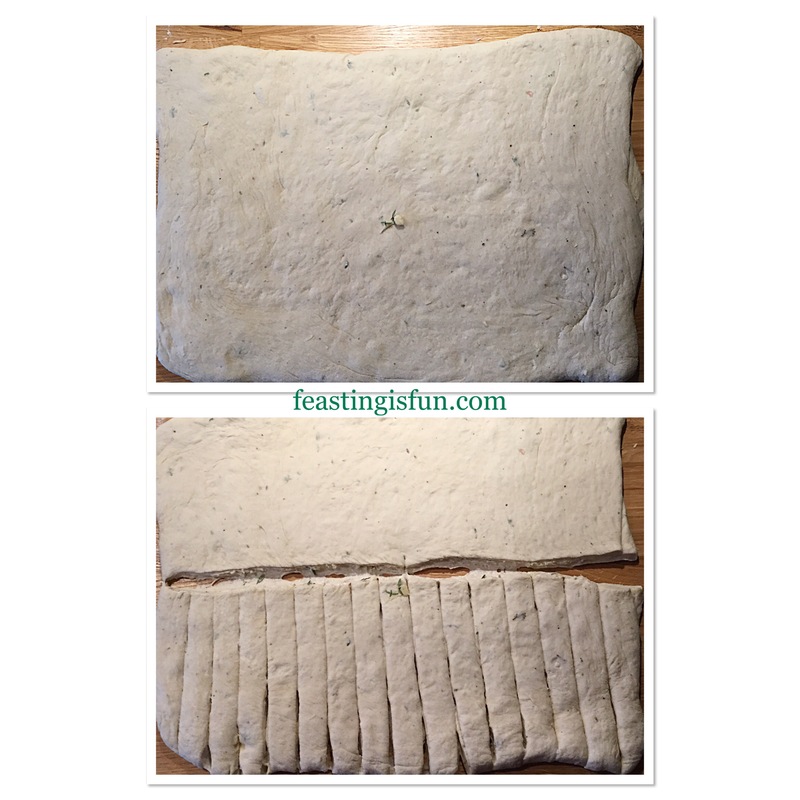 Cut the Ciabatta bread in half lengthways and place on to a baking tray. 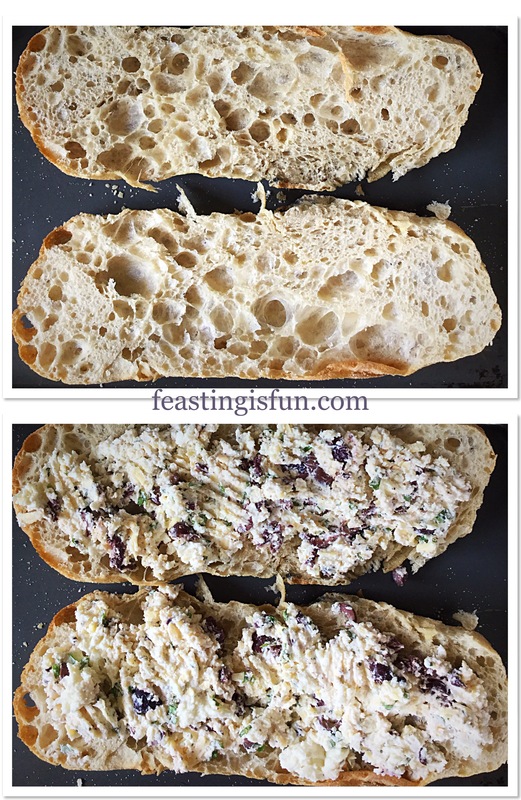 Divide the cheese mixture in half and cover each half of the ciabatta. 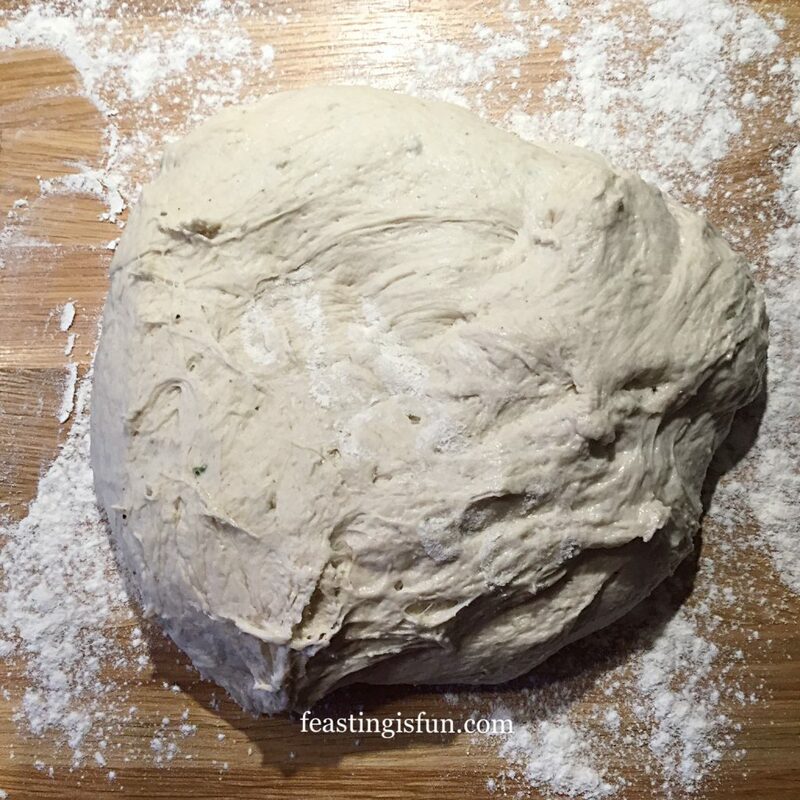 Preparing the ciabatta for baking. 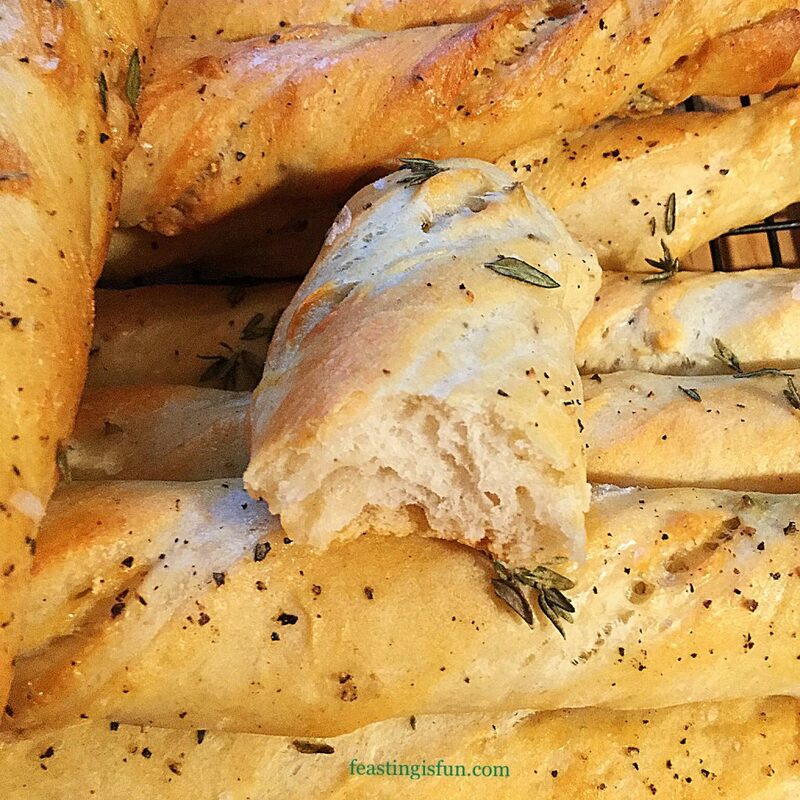 Place the ciabatta into the top of the preheated oven and bake for 15 – 20 minutes. 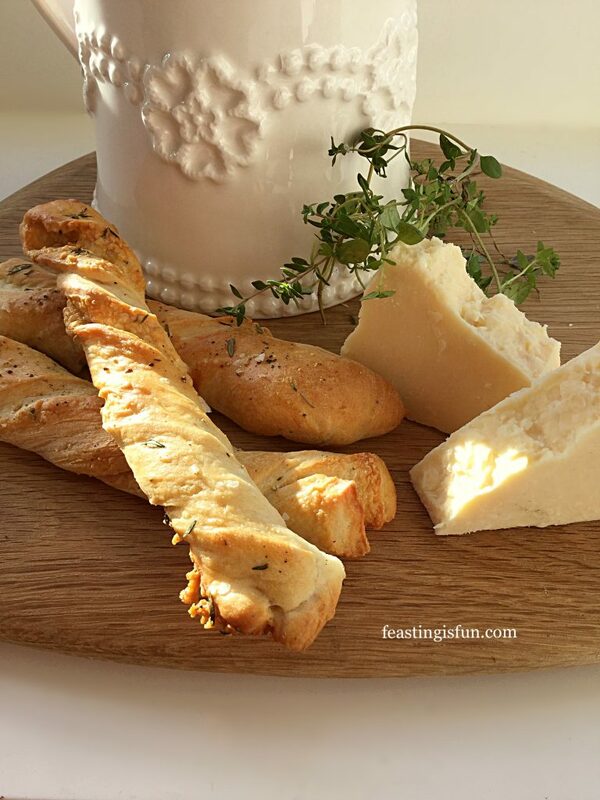 The bread is baked when it is golden and crusty and the cheese is meltingly bubbly on top. 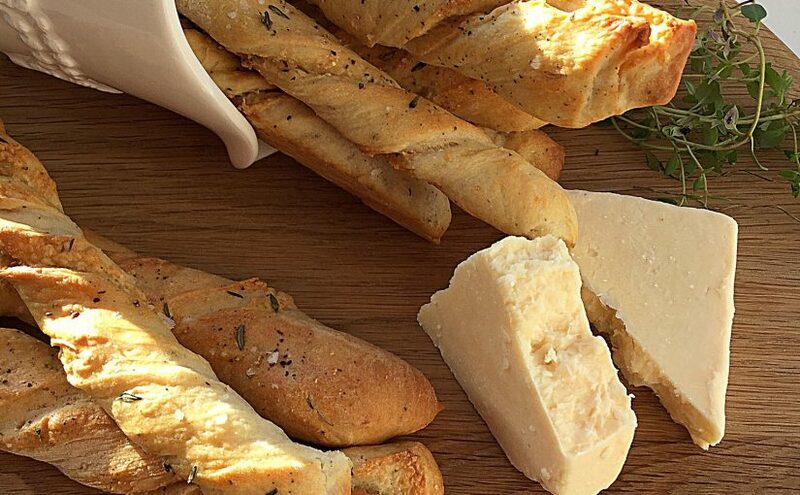 While the ciabatta is baking pour yourself a long, cool glass of your favourite drink! 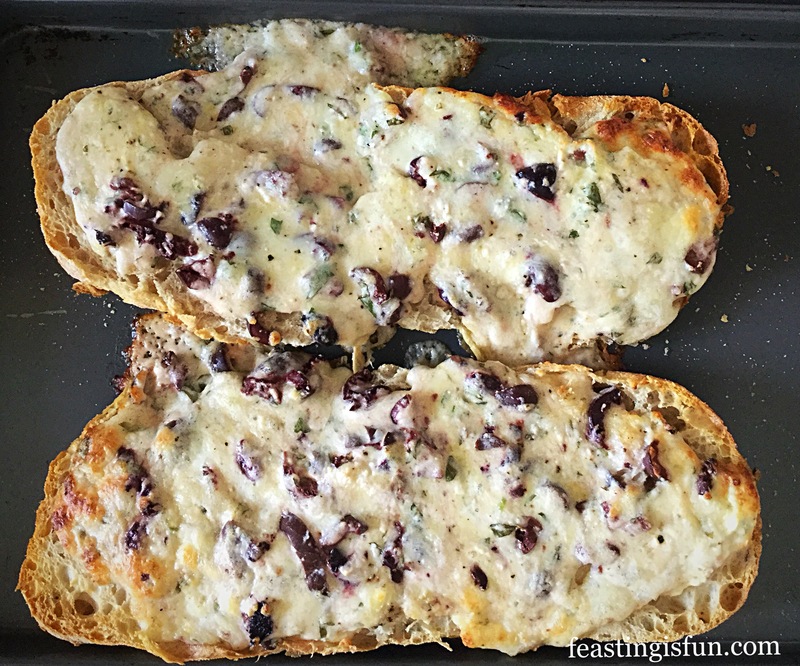 As soon as the ciabatta is baked remove from the oven. Also scoop any melted cheese that has escaped from the bread back on top. 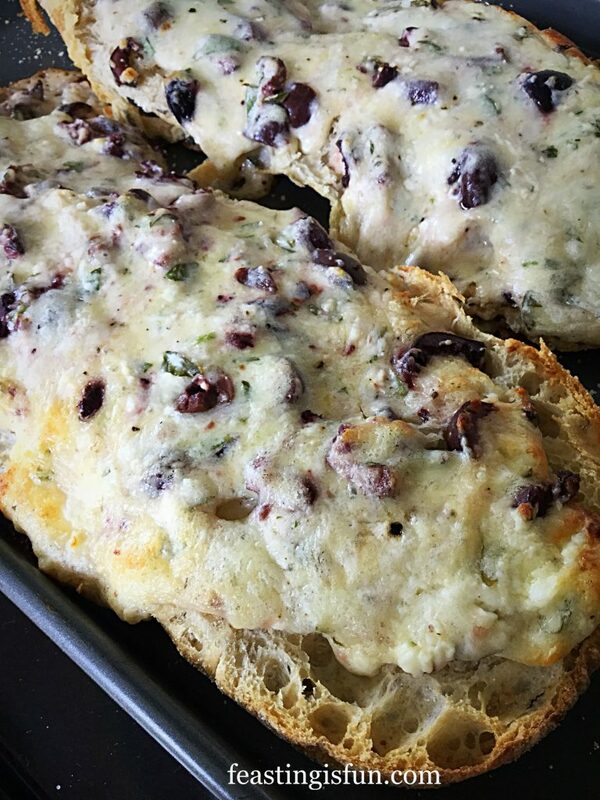 Baked Cheese Olive Ciabatta Bread fresh from the oven. 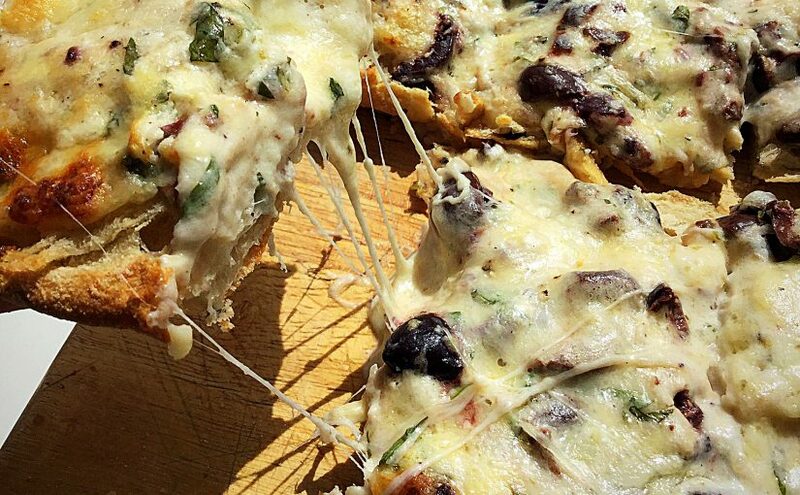 Because I love cheese, especially when it is melted, I could probably eat this everyday. I prefer savoury over sweet anyday. Especially when it has the salty kick of olives. 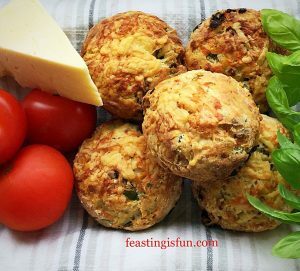 Crunchy and oozing with cheese. 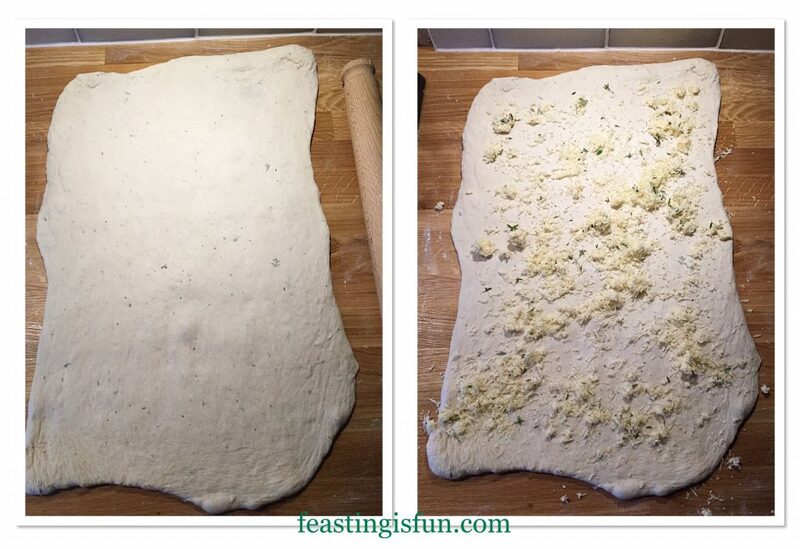 Finally to serve, place on to a wooden board and slice the ciabatta across, dividing each half into 5 or 6 pieces. Pass around to delighted guests. The topping can be made one day ahead and kept in a sealed container in the fridge. Once baked the bread should be on the same day. 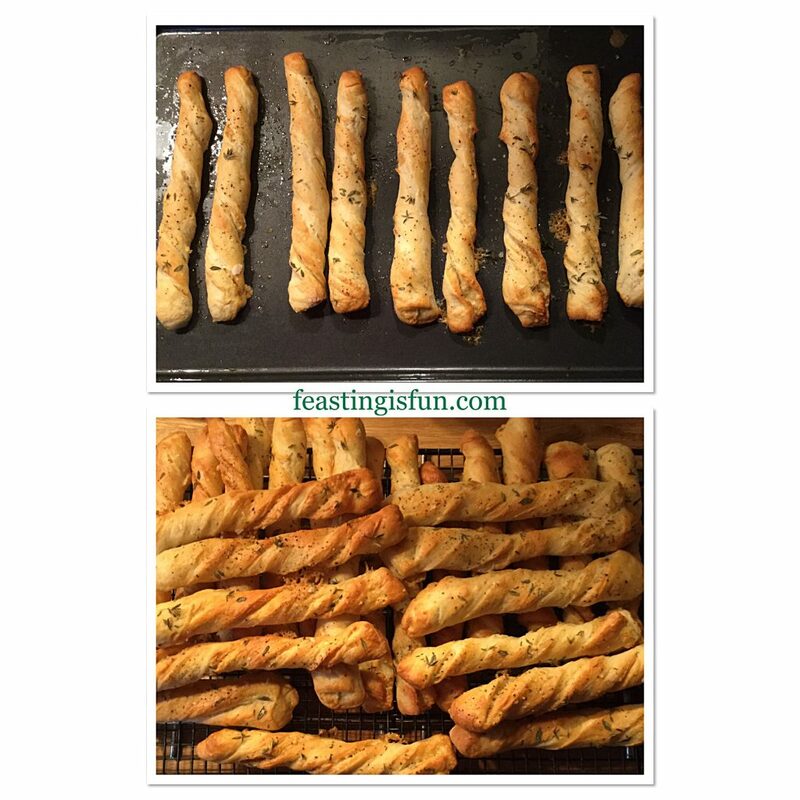 While baking from scratch is something I enjoy, quick easy recipes, or in some cases assemblies, are essential to have on hand. Whether we are rushed off our feet with the busyness of life, or the opposite, too hot or tired to contemplate ‘cooking’, we all need a stash of no fail, easy recipes. As soon as they are assembled and baked, we can breath a collective sigh of relief, take a deep breath and enjoy our time together. Whatever you are making, baking or even assembling in your kitchens, remember to have fun. Food tastes better when shared and the hostess is relaxed! No part of this post may be copied or reproduced without the owner’s express, written permission. Please see my Disclosure Policy. I am so loving the longer daylight hours at the moment. Feeling as though I want to make the most of every drop of sunshine. Winter being a distant memory, I’ve been out in the garden, clearing, ready for sowing and planting. 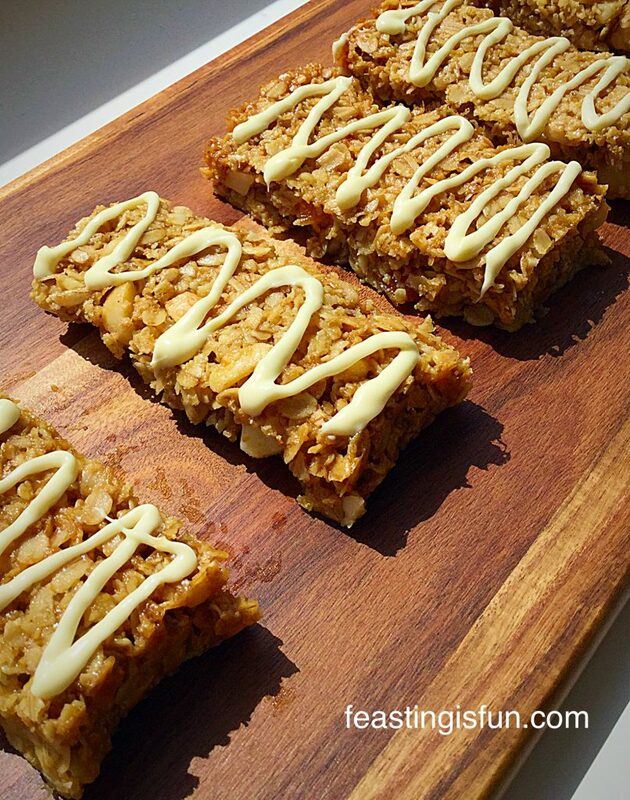 Don’t worry I have also been in the kitchen baking and these Macadamia Apricot Flapjacks are the delicious result. When the weather is warm and the sun is shining I simply love being in the garden. Listening to the chatter and chirruping of birds, feeling the warmth of the sun on my back, our garden becomes my haven again, after the long, cold winter months. So being able to eat breakfast, or more usually brunch, outside is very much treasured. 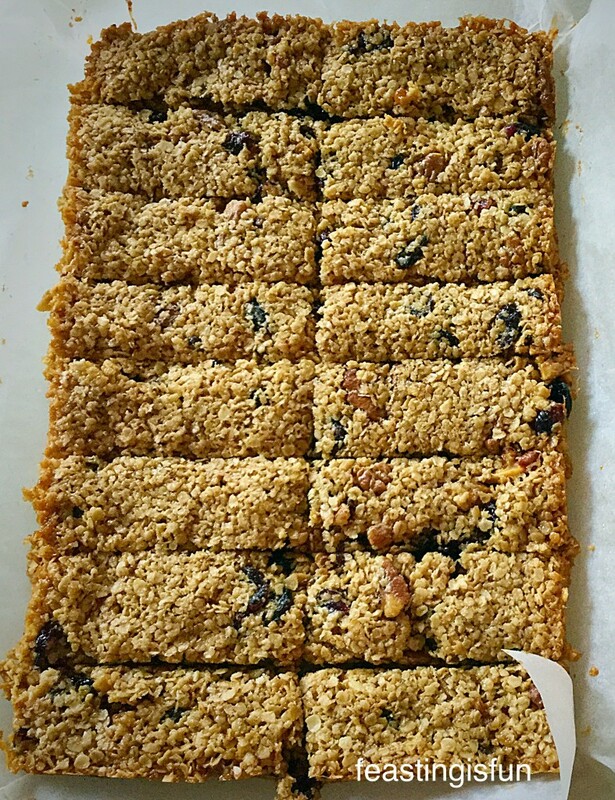 These Macadamia Apricot Flapjacks are perfect to munch on whilst sitting on our garden bench, hot cup of coffee to hand. 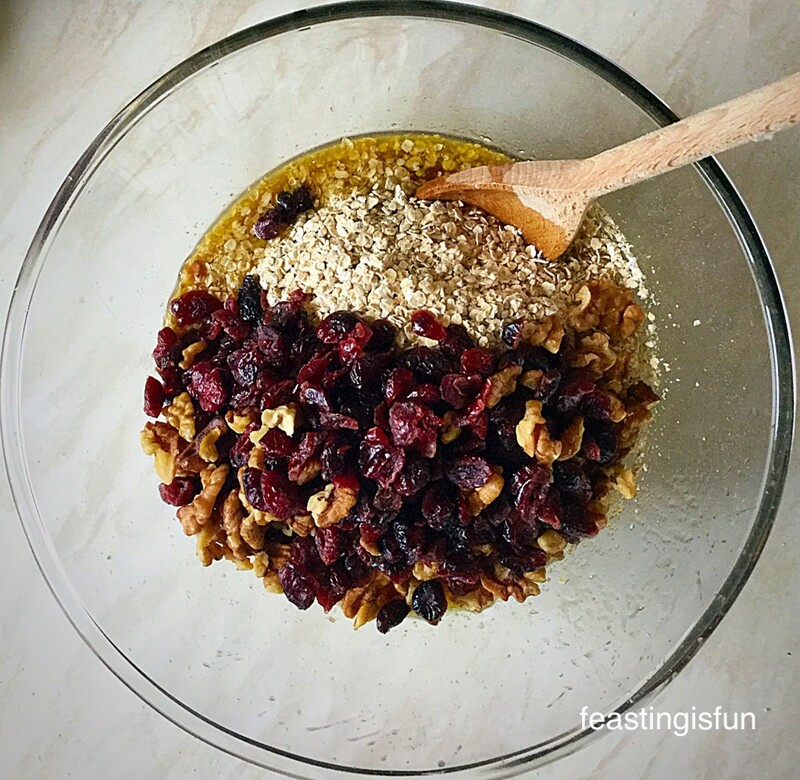 Packed with slow energy release oats, they make a tasty, yet filling alternative to toast or cereal. Macadamia Apricot Flapjacks so good with a cup of good coffee. 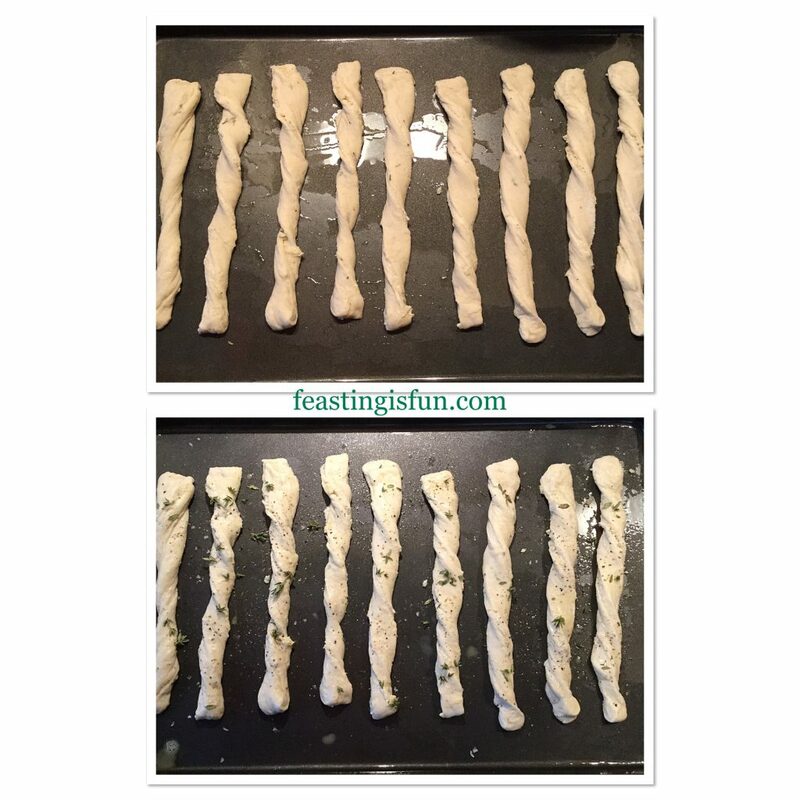 This recipe is so simple and quick. A few minutes in the kitchen melting, mixing, baking and cooling means that you can have a great, portable bar, that is perfect for breakfast on the go, packed lunches, getting through the late afternoon energy dip. 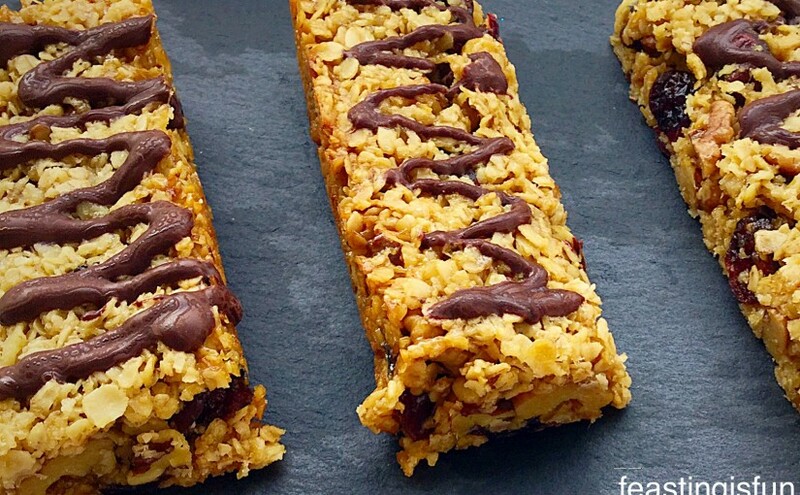 Plenty of deicious bars to see you through the week. 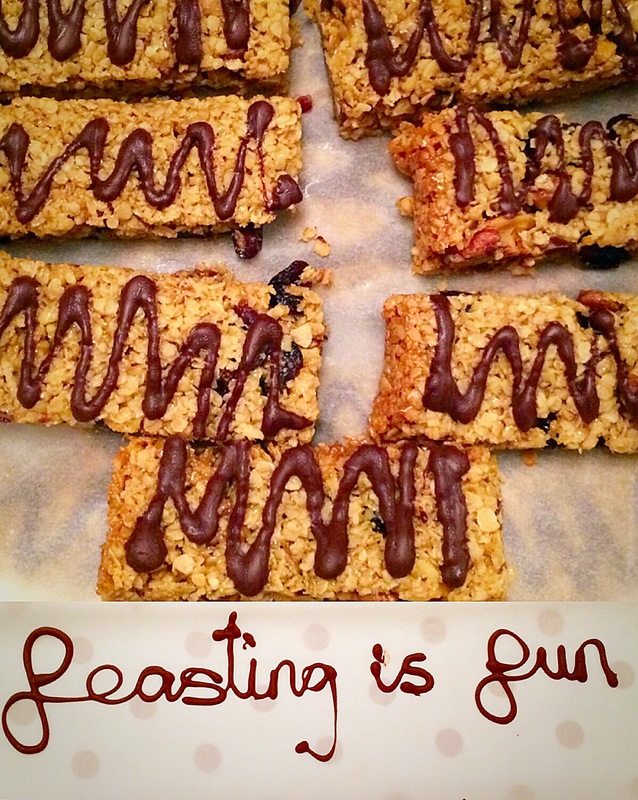 That has to be a winning recipe – right? 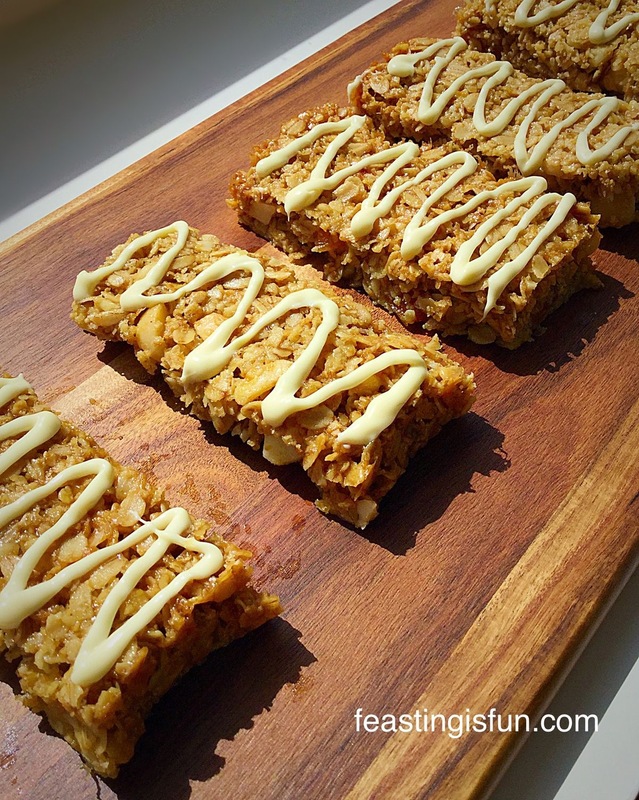 Macadamia Apricot Flapjacks – crunchy, chewy bars of yum! I love easy recipes – more so during the warmer months, when my passion for cooking and baking is matched by my passion for gardening. Yes I still have to work around my body (see – Living with siezures ), that just makes the time I have even more precious. 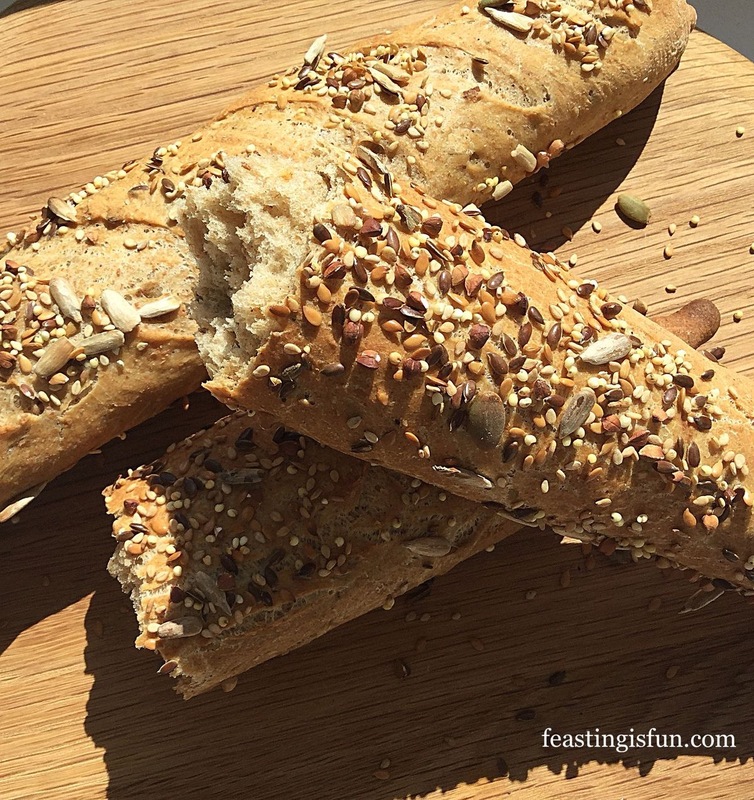 Whilst in the winter I can happily spend all day – relatively speaking – in the kitchen, during warm spring and summer days my preference is to be outside. My hubby jokes that I was born wearing Wellington boots! Whilst I may not be able to do the heavy digging of years past, I still like to get my hands dirty. I’ve also found, especially during the hotter months of summer, baking is best done first thing in the morning. That way there isn’t a hot oven baking bread, mid afternoon, just as the temperature outside is peaking. 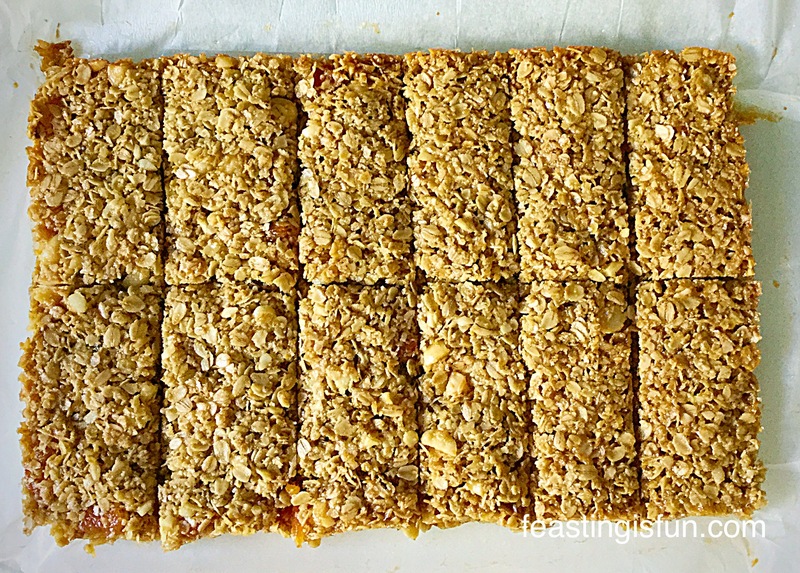 Macadamia Apricot Flapjacks crunchy, chewy and full of flavour. 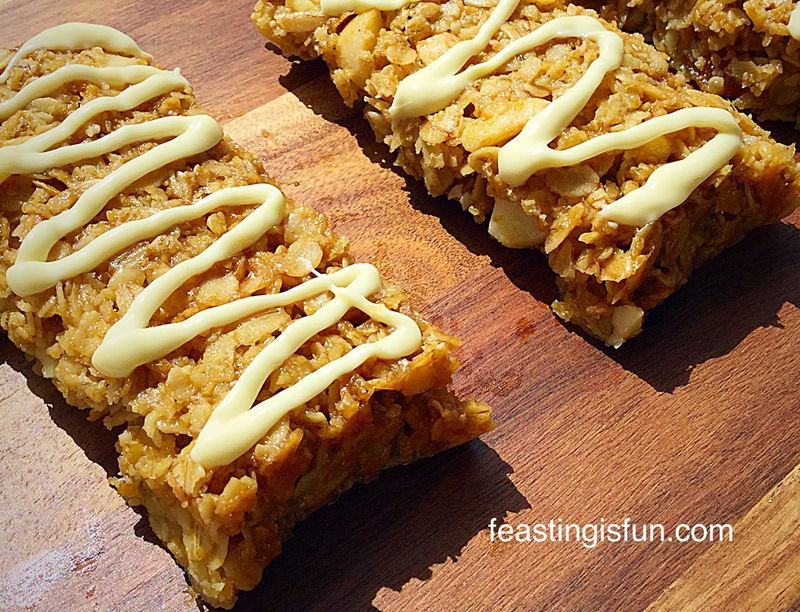 Back to the Macadamia Apricot Flapjacks! 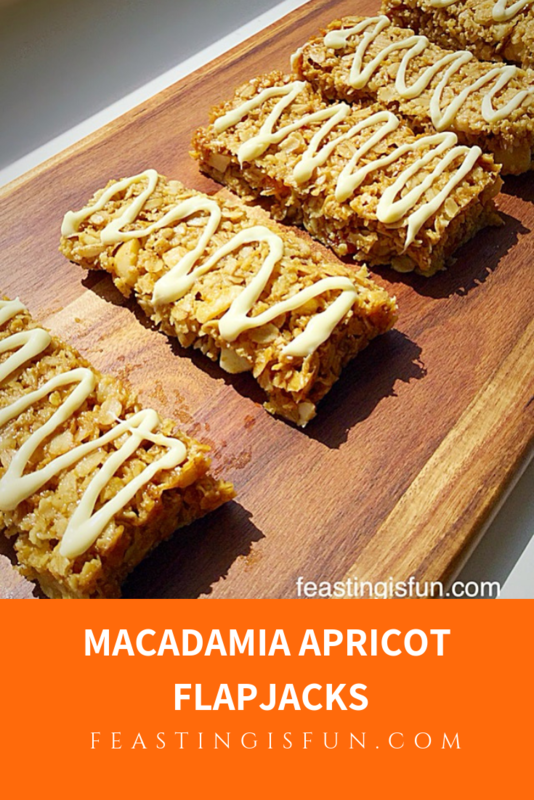 The macadamia nuts add a buttery crunch to these bars that I absolutely adore, however, I know they can be pricey. A great substitute would be almonds, either flakes or whole almonds that you chop yourself. I have used dried apricots that are the gorgeous tangerine orange of their fresh counterparts, however, if you prefer the darker, unsulphured apricots, use them instead. 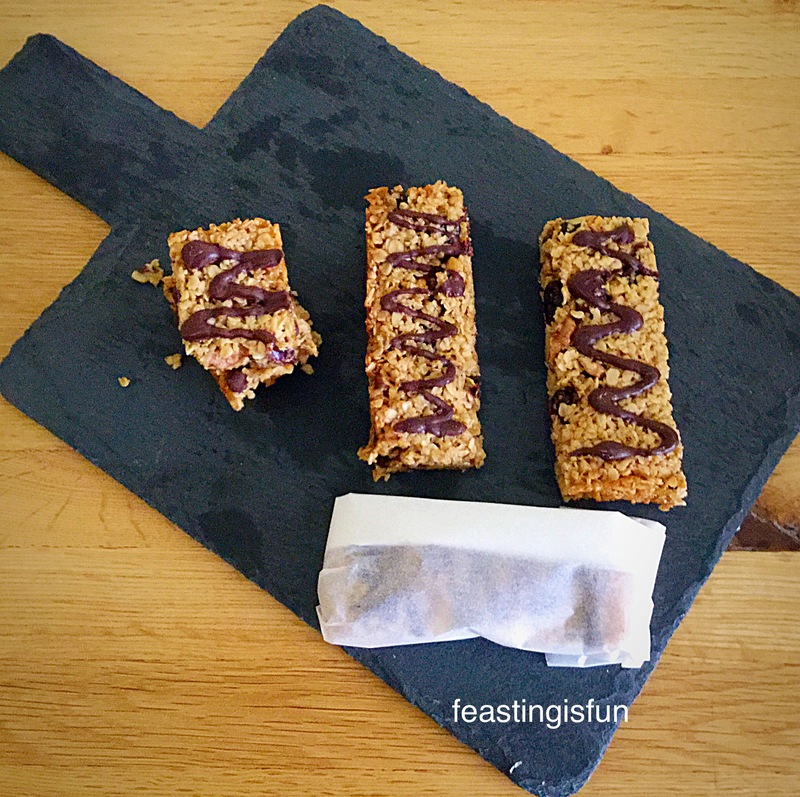 Good quality rolled oats, absolutely make these flapjacks the stars that they are. 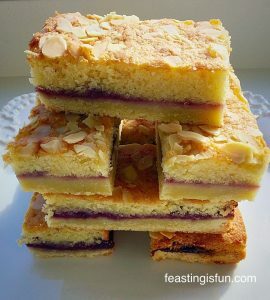 I have specified that these Macadamia Apricot Flapjacks are gluten free, please check the labels of ingredients carefully to ensure that they are so. This is vital when baking for someone on a restricted diet. Their health absolutely cannot be compromised. Grease and line a 8″ x 11″ – 20cm x 28cm swiss roll tin/shallow baking tin, with butter and baking parchment. In a large bowl add the golden syrup. Add the oats, chopped apricots and macadamia nuts and stir to thoroughly combine. Tip the mixture into the prepared tin and press down using the back of a metal spoon, until the mixture is one even layer. 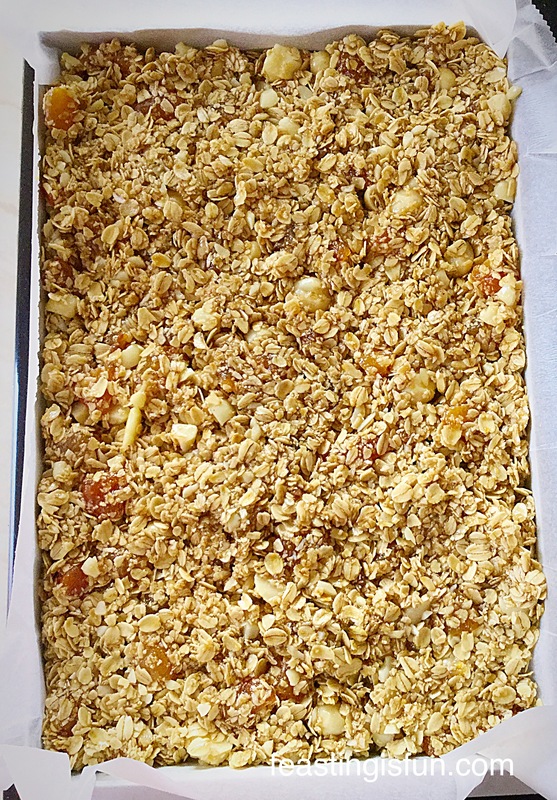 The Macadamia Apricot Flapjack mixture compacted into an even layer and ready for the oven. Place the tin in the middle of the oven and bake for 20 minutes exactly. 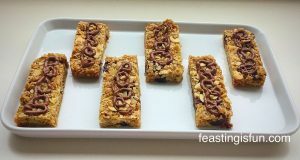 The flapjacks will be a light golden colour when baked – do not be tempted to bake them for longer as this will result in them being hard, not chewy! As soon as the flapjacks are baked remove the tin from the oven and allow to cool completely. 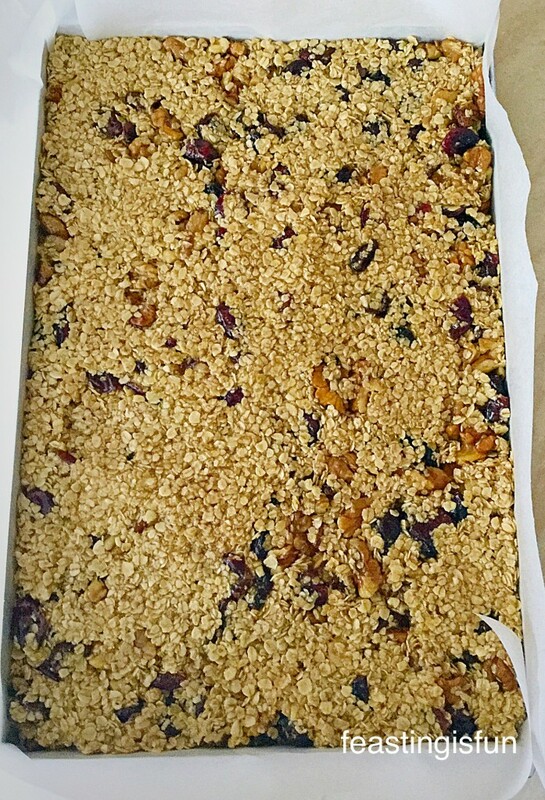 When completely cooled remove the entire flapjack bake from the tin, using the excess baking parchment to help lift it out. 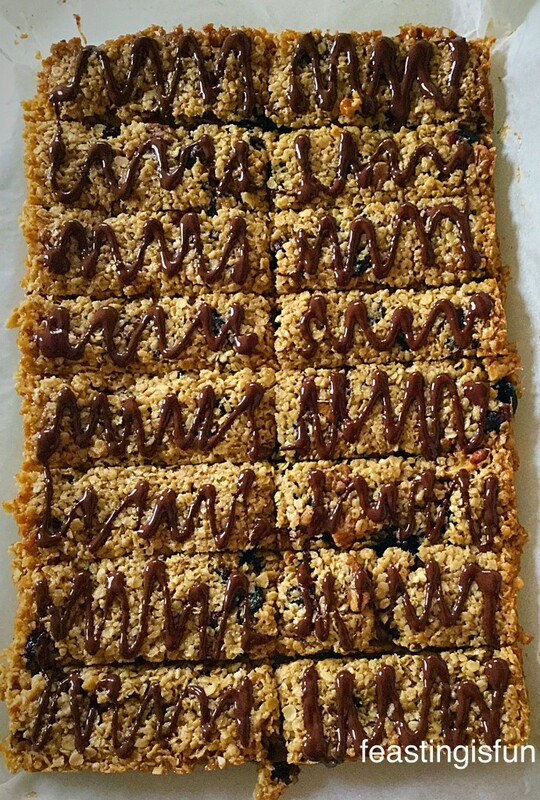 Macadamia Apricot Flapjacks ready for the finishing touch. 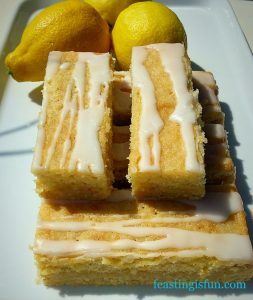 As seen above, cut down the middle length of the bake and then across the width. Cut each quarter into 3 generous bars – you could cut each quarter into 4 making 16 individual flapjacks in total. 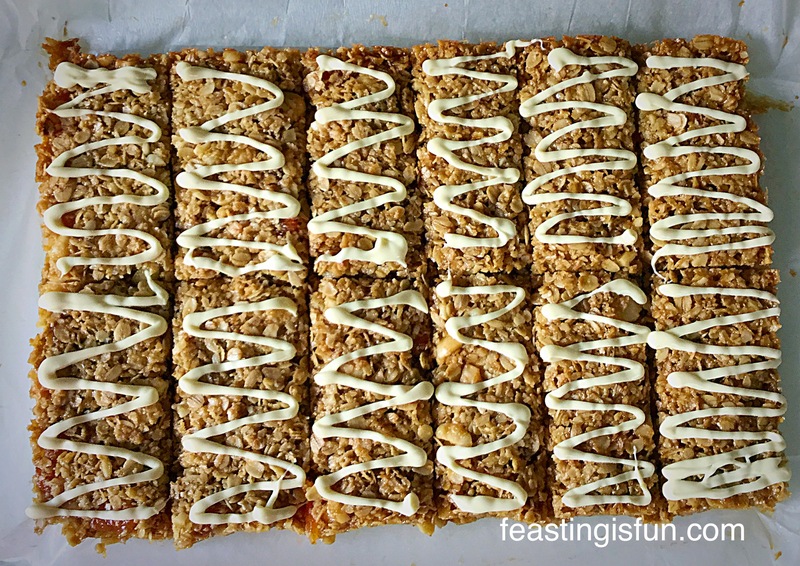 Macadamia Apricot Flapjacks with a drizzle of white chocolate. To finish the flapjacks – chop the white chocolate into small pieces and place in a heatproof, microwaveable bowl. Zap for 20 seconds at a time, stirring between each heating session. When the chocolate is half melted, remove from the microwave and stir until completely liquid. Fill a small disposable piping bag with the melted chocolate. Snip off the very end of the bag, creating a small hole. 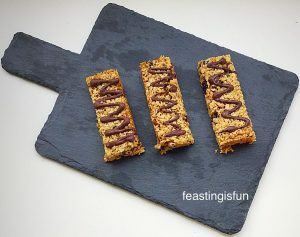 Pipe swirls or zig zags of chocolate onto each flapjack to provide a beautiful finish. 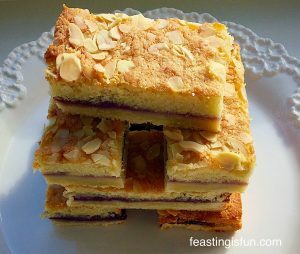 Macadamia Apricot Flapjacks as pretty to look at as they are delicious to eat. 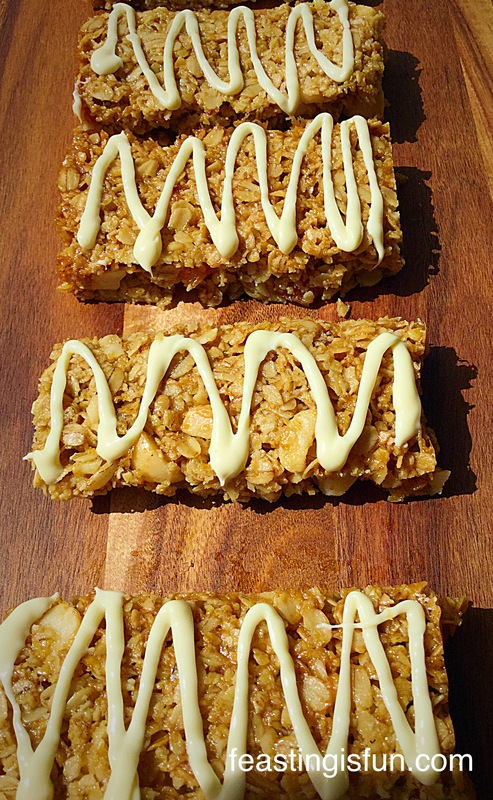 Ooh how completely yummy do these Macadamia Apricot Flapjacks look? A couple of notes: During the summer, once the flapjack bake has cooled to room temperature, if the ambient temperature is 25C or above, it may be worth popping the tin in the fridge for an hour to allow the flapjacks to completely set. 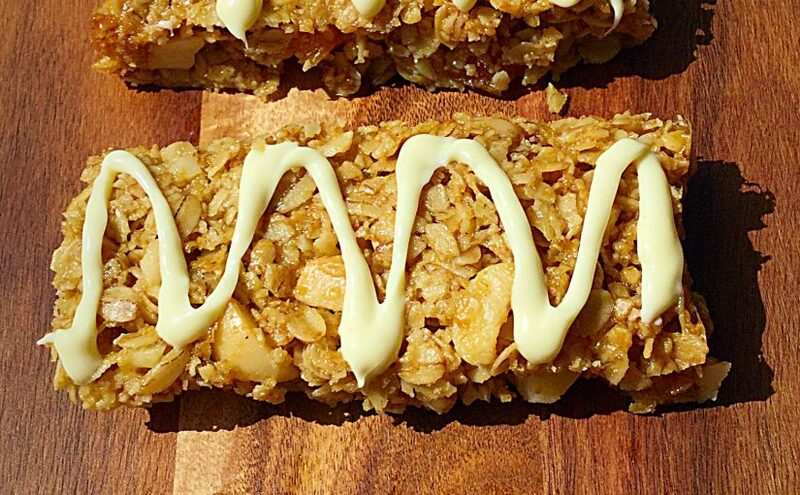 Likewise, unless the flapjacks are stored in the fridge I would leave off the white chocolate drizzle. If these Macadamia Apricot Flapjacks are going to get warm throughout the day, whether in a packed lunch box, or a bag, the white chocolate will melt and create a whole lotta mess! This is just my advice as a mum of three and wife to hubby who takes a packed lunch to work. 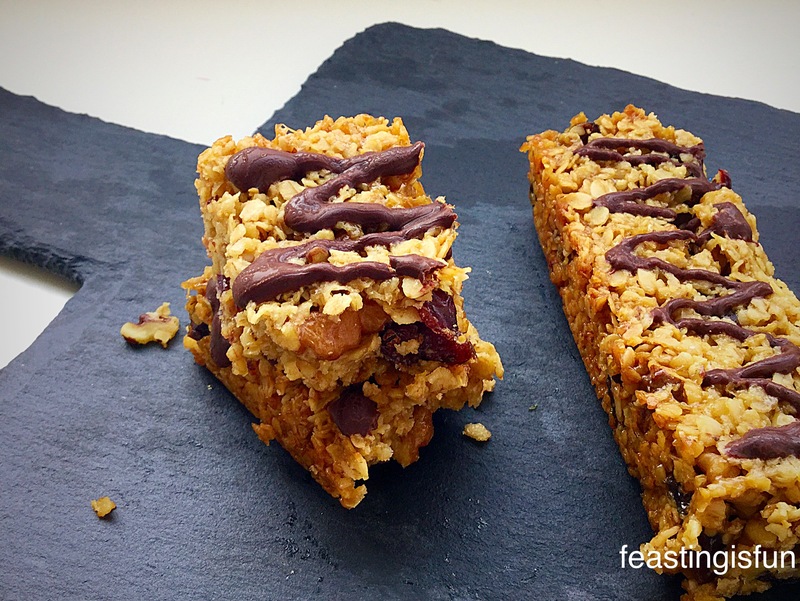 Love these Macadamia Apricot Flapjacks? Here are a couple of other recipes you may like to try as well. 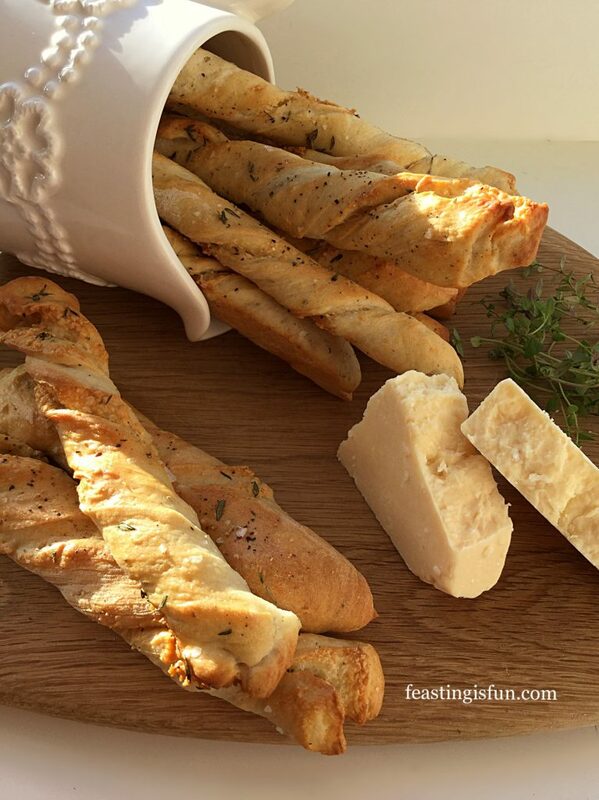 While spending time in your kitchen, baking and cooking, have you ever thought of making extra and sharing some? We all have people in our neighbourhood who are lonely and perhaps a little unhappy. Inviting them round for a chat over a cup of tea and delicious slice of cake, or flapjack, may seem such a small thing to us and yet can make the world of difference to someone else’s day. Time seems to be so precious to many, which is why it is such a valuable gift to give.